It was one of those emails I wait for. Like in the years when I used to walk with my eyes on the pavement hoping to find a £50 note. Or even a £1 coin. 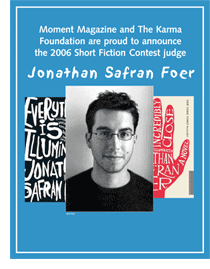 Well, after the Dear Shaun bit, they said The story you submitted to our 2006 contest, “Mark Gertler in 13 Sketches,” was selected by our judge, Jonathan Safran Foer, as this year’s first-placewinner. And then they said other things like we’ll fly you to NYC and stuff. But by then I was in tears. And I thought: Now I know why those actors cry when they win the Oscar – it’s years of hard slog and waiting and hoping and telling yourself that you’re doing this only for yourself and not for anyone else. But those words “you have won” can bring you to your knees with gratitude. It’s like arriving at the cathedral steps after a long pilgrimage. And, yes, on some level this is all hyperbole. This is a real confidence boost for Whitechapel Boys – now I have to get this book done!